The WMS40 Mini Dual Instrumental Set is a true plug'n'play wireless solution providing crystal clear audio sound. 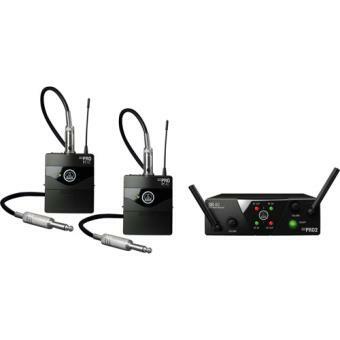 Each of the two included PT40 Mini body-pack transmitter provides a professional 3pin mini XLR connector, compatible to all guitars, basses and AKG's MicroMics, from line to mic level. Their extremely long battery life of 30 hours off a single AA battery saves money in day-to-day use. The receiver offers two balanced outputs via 1/4" jack connectors.